This indoor fairytale forest featured a custom built gold acrylic bridal table and backdrop, charger plates, mirrored table tops and bespoke centrepiece stands provided by Events by Nadia. This wedding was designed and produced by Jason James Design at Waterview in Bicentennial Park. 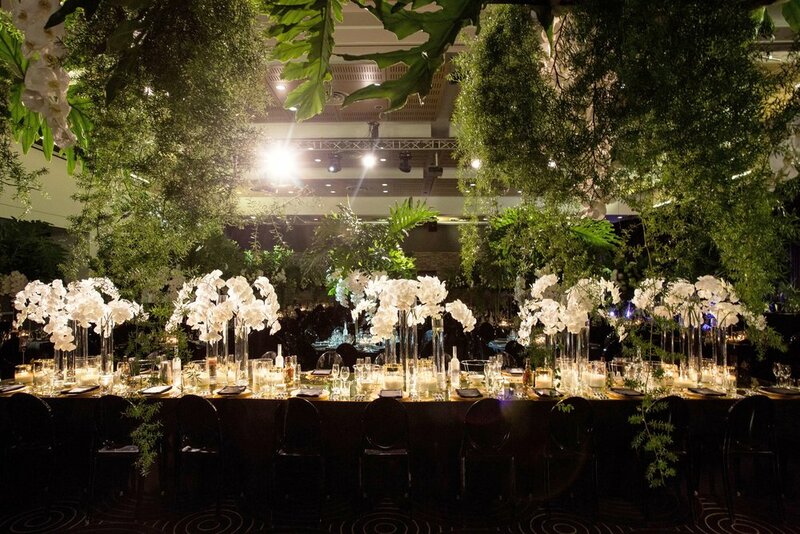 The centrepieces, ceiling installation and bridal table backdrop consisted of a mix of loose, vibrant green foliage and premium white Orchids perfectly arranged by Seed Flora. The tablescapes were completed with hand poured soy candles by Loved by Lucy XO. Images courtesy of GM Photographics.